Your Template Finder Toolbar is the PUP that uses misleading techniques to prevent removal. Use Reimage to locate malicious components and get rid of them faster than with uninstall instructions. A full system scan blocks virus reappearance and prevents traffic to malicious domains. Your Template Finder is an unwanted application which is supposed to provide users with the quick access to templates for coupons, flyers, resumes, labels and so on. Mindspark, the developer of this service, is well known for distributing similar free software, including various browser plug-ins  and toolbars. Unfortunately, the majority of programs developed by this developer are categorized as browser hijackers and adware-type programs. You should be careful if you decide to install Template Finder on your device. Gives an access to various templates, e.g. resumes, flyers, labels, etc. Your Template Finder toolbar has been classified as a potentially unwanted program (PUP), due to its behavior inside the computer system. Typically, it alters its settings and starts presenting the search results via MyWay search provider. These search results are typically filled with in-text links and similar content which redirects users to required websites. Keep in mind that these sites are hardly monitored and you can find yourself on an infected domain or a phishing site. Another thing we think we should point out is the fact that Template Finder add-on is closely related to ask.com search site. While this search provider is undoubtedly legitimate, it can be dropped on your system without any warning. In addition, it can start negatively affecting browsing experience by redirecting you to sites that you don't know. Usually, it spreads bundled with freeware because it's the easiest way to infiltrate programs into users' computers without their notice. 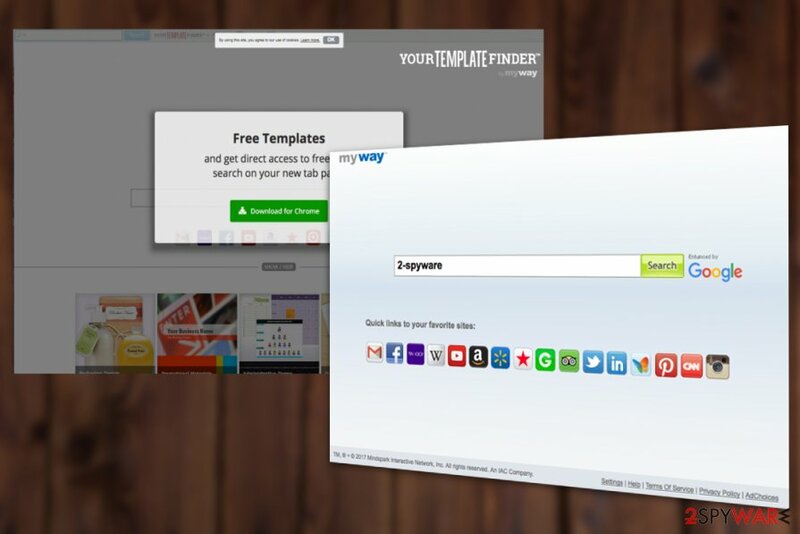 If it performs this task successfully, YourTemplateFinder Toolbar sets MyWay, which is a customized Ask version, as a default start page and search provider. In addition, you can start noticing various ads and popups as well. If you have not been thinking about Your Template Finder removal yet, we recommend you consider this idea very seriously. There are numerous activities initiated by this PUP without your notice that can be stopped only if you get rid of this intruder. For this procedure, please use reputable security software such as Reimage that will guide you through the whole PUP elimination process. Your Template Finder Toolbar download page and Myway search site it sets as default are illustrated in the image above. Even though this search engine is legitimate, it is not reliable due to the fact that it has been spread with the help of bundling and is known for promoting sponsored websites. We do not recommend browsing thru this search site because you may be provided with altered search results filled with unsafe links and advertisements. As a result, clicking on any of Your Template Finder ads may be forced to visit questionable websites or even install other potentially unwanted programs. In addition, you may notice that your web browsers performance has diminished and that Your Template Finder search provider displays ads that correspond to your most recent searches. That's because this toolbar can collect non-personally identifiable information  about your web browsing habits and share it with third party advertisers. However, be aware that the personally identifiable information is not safe as well, so you should not keep such a misleading program on your computer. Launch a reputable antispyware program and initiate a full system check. This way, you will not only remove Template Finder from Safari, Chrome and other web browsers. This procedure will also help you to get rid of other PUPs as well and will protect your system in the future. This and other Toolbars from Mindspark have been spreading around with the help of freeware/shareware. Unfortunately, this is the main way how various PUPs infiltrate systems without any notice. Once installed, they corrupt web browsers without users' authorization, start tracking their online activities and display compromised search results with an intention to boost traffic to affiliate websites. No matter if you are going to install familiar and well-known freeware, you have to be very careful during its installation as well. Select Advanced or Custom installation option and monitor the entire process attentively. Inspect every checkbox and look for “optional downloads”, such as browser add-ons, toolbars or extensions. Make sure that you opt them all out because, otherwise, you may end up with a potentially unwanted program, such as Your Template Finder Toolbar. There are many apps similar to this one. For example, Total Dating Guide Toolbar, Puzzle Games Daily Toolbar, MyWeddingAdviser Toolbar and so on. To prevent them on your computer, apply the above-mentioned steps when installing freeware and try to protect web browser from being hijacked. To remove Your Template Finder Toolbar, you can either install an anti-spyware or check the system and clean web browsers by yourself. If you need a detailed guide that would clearly illustrate the whole removal procedure you need to go thru, you should scroll down the article and find “Manual Removal Guide.” Make sure you follow all these steps carefully to prevent unexpected issues related to your computer. However, to initiate a full system check and restore it to its previous state, we would recommend running a full system scan with updated anti-spyware. Take into account that you can never know what other programs have managed to infiltrate your PC system without your notice. Programs that are listed below have been tested and approved to capable of dealing with a full Your Template Finder Toolbar removal. Here, look for Your Template Finder Toolbar or any other recently installed suspicious programs. Wait until you see Applications folder and look for Your Template Finder Toolbar or any other suspicious programs on it. Now right click on every of such entries and select Move to Trash. When in the new window, check Delete personal settings and select Reset again to complete Your Template Finder Toolbar removal. The Microsoft Edge reset guide below will assist you in rolling your browser's default settings back to normal. Once these steps are finished, Your Template Finder Toolbar should be removed from your Microsoft Edge browser. Here, select Your Template Finder Toolbar and other questionable plugins. Click Remove to delete these entries. Now you will see Reset Firefox to its default state message with Reset Firefox button. Click this button for several times and complete Your Template Finder Toolbar removal. Here, select Your Template Finder Toolbar and other malicious plugins and select trash icon to delete these entries. Click Reset to confirm this action and complete Your Template Finder Toolbar removal. Here, select Extensions and look for Your Template Finder Toolbar or other suspicious entries. Click on the Uninstall button to get rid each of them. Now you will see a detailed dialog window filled with reset options. All of those options are usually checked, but you can specify which of them you want to reset. Click the Reset button to complete Your Template Finder Toolbar removal process. ^ Plug-in (computing). Wikipedia. The free encyclopedia. ^ Potentially Unwanted Application/Program. Scanguard. Support page. ^ Michael Sweeney. What Is PII, non-PII, and Personal Data?. 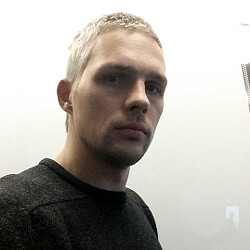 Piwik. iwik PRO Marketing Suite page. ¿Cómo eliminar Your Template Finder Toolbar? This entry was posted on 2019-04-01 at 00:10 and is filed under System tools, Viruses. You can quickly scan the QR code with your mobile device and have Your Template Finder Toolbar manual removal instructions right in your pocket. How did you remove Your Template Finder Toolbar?